Shu-Yin's Sanctuary: Shern's Cycling Journey! I'm so proud of my son today. Why? Because Shern can now ride a bicycle without the training wheels! Shern started out riding a bicycle with the training wheels at about 3 years old. He only did a half-round pedal cycling initially. Haha. And then earlier this year, we took out the training wheels of the same bicycle and hubby tried to teach Shern how to cycle without them. But we were not successful. 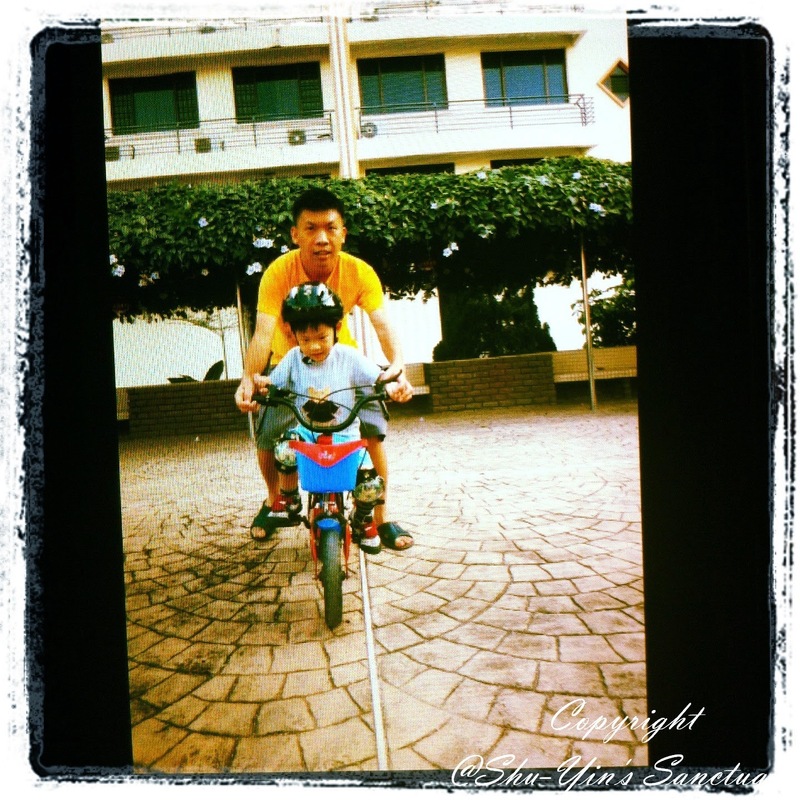 Shern got scared and was wobbly and didn't have the courage to continue without daddy holding his bicycle steady. So we let it rest as Shern was not too keen to learn too. And then after reading up the benefits of having a balance bike, I decided to get one for Khye to have him learning how to balance at a young age. Hunted the whole Penang and in the end found only one bicycle shop who is selling balance bike for kids. And is the brand I wanted - First Bike. Unfortunately the bike is still too high for Khye and it needed a lowering kit to make it lower before Khye could ride on it. And the shop didn't have the lowering kit. So while waiting for the lowering to arrive (I ordered it online), I let Shern ride on the balance bike and hoping that he would learn how to balance on it soon. And so in this half month, Shern had a go on it, and he enjoyed riding it. It was within days and only second time on the balance bike he learned how to balance more or less on it. I was rather amazed on how the balance bike somehow taught him how to balance on his own. 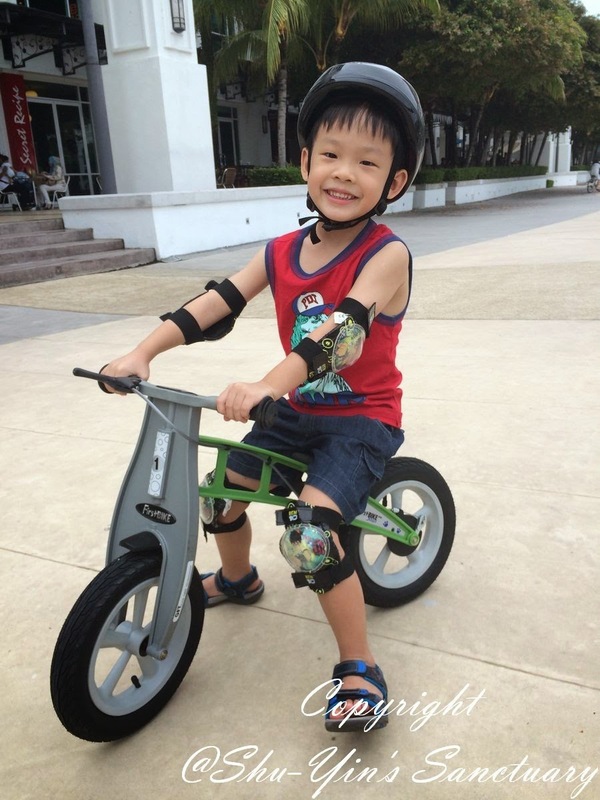 Shern's second time on the balance bike and he had so much fun it in! And now, half a month later, I noticed that he could balance really well on the balance bike. After gaining some momentum in our rather limited space porch, he could balance and do more than a round in it without putting his legs on the ground. And so we figured out he could have a try on his two-wheeled bicycle. Hubby helped him hold it initially to give him some confidence. And just on his 3rd push, hubby let go his hands and we could see Shern cycling on his own. Whoah!!! And I managed to caught it on video...how about that! You can see that Shern is doing really well. We gave him some tips like 'look straight ahead and don't look down', 'and just continue to pedal hard and don't stop' to balance better. And oh by the way, I super recommend getting a balance bike as the first bike for your kids if possible. The kids will grasp the concept of balancing fast and really well with it, and it would be a smooth transition to learning how to cycle with the two-wheel bicycle in the future. And that was how my eldest boy finally knows how to cycle a two-wheeled bicycle at 5 years 3 months! And that is quite an achievement indeed! p/s - I am going to write a review post (NOT a sponsored post btw!) on the balance bike soon, when I have the time. I've seen those balance bikes around but never knew the real practical application of how they help in learning kids how to ride a bike. Got me thinking about it for Nathan as well. He enjoys riding his bike with training wheels but I never thought riding two wheel would happen until far down the track. Great info and look forward to the more detailed review. may i know where you get the balance bike from in penang? We got it in a bicycle shop named Kalachia in Times Square!